We are pleased to offer these fine authentic and historically made leather possibles bags and pouches for hunting, re-enactment and rendezvous events. 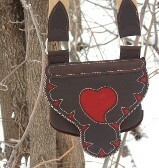 This a copy of an early "weeping heart" possibles bag from the Pennsylvania area. Large, Fringed, plains bag. It is extremely decorative with tacks, fringe, horn buttons, and threads. A good amount of pouches from the 1750's-1800 had themes such as stars, hearts and animials cut out in the leather with a cloth backing. This is a rare example from the northeastern colonies. We call it the wolf hunter. The symbol of the cross has been on clothing, rifles and possibles bags for centuries; this one has a Spanish flavor and would have been seen throughout the Southern Rockies during the fur trade. The symbol on this particular possibles bag is known as the Cross of Lorraine. 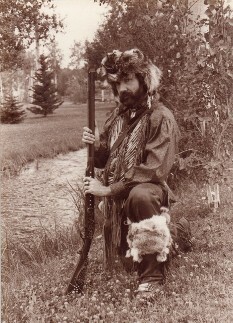 It dates back to French trappers and explorers from the early 1600's in Canada, Upper New York and the Great Lakes area.